Yay, I can't turn off my computer anymore or else I need to wait half an hour for scandisks, and even cancelling them, I spend ten minutes turning on the computer for a 15% (estimated) chance of the monitor actually working. My computer is dying! I've updated strips 14-18, had to take a break due to an annoying negative reaction to Poison Ivy on my hands and face. I added some stuff to the Author page. I also have started to drink Cappuccino, and fail to realize how I managed to function before I learned of the stuff. On another note, I need some suggestions regarding my current main computer: in short, its not going to stand much more use. It's power supply is too small, so my Zen MicroPhoto successfully connects only 5% of the time, and there is a random chance that the computer gets stuck in a phase in which Windows boots up, but the monitor simply stops working. This is only remedied by trying continuously to turn on and off the computer. Also, my computer has no real functional fan. For ventilation, I need to open the case and keep a regular room-fan near it, also meaning that I need to turn it off often during the day. Also, the older hard drive has started to die (as in, I had to disconnect it to prevent it from completely stopping permanently). I'm not yet in the market for a new computer (waiting for Vista, despite the Windows Live beta tests I participate in, which don't work on this computer), particularly due to the cost (I've not the most money in the world). I'm sure there is more, but I can't think straight so early in the morning. I could really use suggestions to help my computer live a while longer, or at least function better, at a low cost. Ultimately, it looks like I'll either have to buy a new computer or (hopefully) buy Photoshop for my laptop. Send suggestions to mcgblade@msn.com . 6/26/06 Finals are over! Each day this week, I'll be finishing the remakes to get back on schedule. Right now, I fixed 10 and 11, and remade 12 and 13. More to come as the week progresses. 5/25/06 Sorry for the lack of updates for quite a while but a few things - first of all, I've spent a lot of time work on an entry for an art magazine, which I am almost finished with, and second, I have some relatives over all the way from Poland who haven't seem me in many, many years. I should have time on Friday to work on some strips, particularly with the long weekend and the fact that the magazine entry deadline is Friday. 5/14/06 NEW FRONT PAGE LAYOUT ! ! ! 5/9/06 - TWO WORDS, well, one word and a number, anyway, HALO 3. WATCH THE TRAILER. 5/2/06 - Strips 7, 8, and 9 updated with comments. Gonna go watch House now. 4/30/06 - Check old strips: 4,5, and 6 'ave been updated. Silent Hill is an awesome movie, go see it. So is Shaun of the Dead. G'Night. That's right, I'm not MIA after all. Despite that, time seems to be working against me, pushing me back. I keep underestimating how much time stuff takes. That's why I'm here to say that I'm back! I have managed a solution that manages to say "Screw You!" to work ethic and tasks and all that while still managing to complete my appointed jobs AND update BH! It's a freakin' miracle (not really)! Regardless, I have sorted a whole lotta stuff out, in particular the small minute things, and the larger things. I managed to make sense out of a scheduling system that is somewhat realistic, and yet will work. Despite the factors working against me (those being chiefly time, the laws of thermodynamics and motion, and virtually every other concept regarding movement and time travel) I can manage. 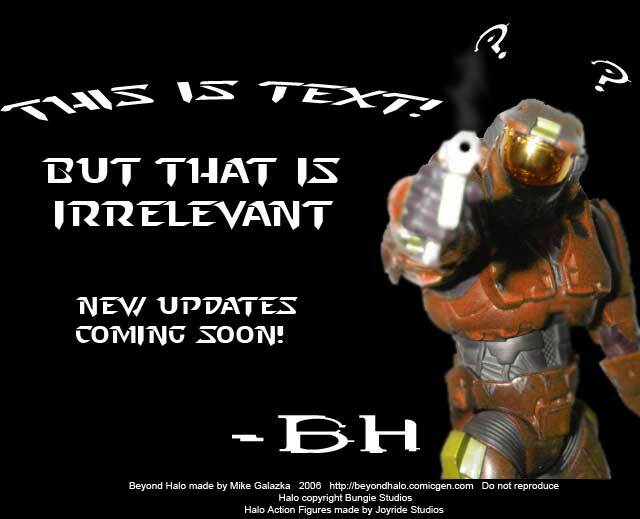 By better utilizing time between work, food, and House on Tuesdays (despite DVR, I need to watch House live) and the juggling of small tasks on Saturday, I'll be able to create the proper updates for BH to come out every Wednesday and Sunday as scheduled. This also means that I will be able to finish updating all the old comics, but one thing at a time. Unfortunately, all of this complex planning and sifting of information and the obligatory stabbing of large table-sized maps (it needs to be cinematic!) means that a Wednesday update is unlikely, in the traditional sense. For the mean time, take solace in the fact that I have been thinking about new crazy concepts, and that the story of BH is being compounded on as the concepts, ideas, and insane thoughts all come together like a Rubik's Cube made of Modron Cubes. Little Modron Cubes with crossbows. NEWS 4/11/06: Work keeps on piling up, but Spring Break is coming soon! I'll have much more time to complete the missed updates. As for the status of Wednesdays update, I have a GREAT idea, but I need some time to finish it - Thursday or Friday should be when its up, check then. In the mean time, look up Sealand, a micronation off the coast of the UK with a population of 5 and a size of 550 meters stationed on an oil rig. It's a damn good idea, isn't it? NEWS 3/29/06: Chapter 0 image is up, first strip has been updated, comment system has been tested and works. More updating to come soon. NOTE: I was in a hurry making this, so its most likely not in the finished state. I was sick (and still am), along with the rest of my family. Roof repair left constant sound on our heads, along with tire-puncturing nails on the driveway (there's no way I'm paying for new tires). The roofers blew out about two handfuls of fuses. The electrical people haven't really started anything. Apparently my windows need repair and replacement as well. Damn house, its too old. I got a new laptop as a gift (HP Pavilion zv6130us Notebook, 80 gig HD, 512 RAM, 2 GHz, 15.4" widescreen, Athlon 64, DVD burner). I managed to get someone to replace my Zen Micro Version 1 with a Zen MicroPhoto for free (the Micro Version 1's had a serious issue with the headphone jack) and replaced under half of the music (the synch programs for the Micro and MicroPhoto are not interchangeable). I watched so many episodes of Futurama. I bought three great books on Amazon, and I bought The Elder Scrolls: Oblivion. Gonna update the old comics to the new format and change some things as well as implement some new system of some sort. Planning on updating large portions of the site, some should be updated already. By this time, the archives, the links, and the author section have been completely revamped. Beyond Halo is hosted on Comic Genesis, a free webhosting and site automation service for webcomics.